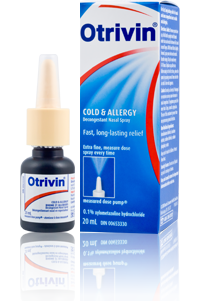 Otrivin Cold & Allergy Decongestant Nasal Spray. For fast, soothing, long-lasting relief of a blocked or stuffy nose. Measured Dose Pump for accurate dose, every time. Adults: Remove protective cap. Hold bottle upright with thumb under base and nozzle between first and second fingers. 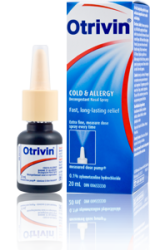 With head tilted slightly forward, spray once into each nostril. Breathe deeply. May be used every 8-10 hours. Replace cap after use. Prime the pump by spraying several times into the air until a fine mist appears. Use only as directed. Prolonged or excessive use may cause increase in nasal congestion. If symptoms persist for more than 3 days, consult a physician. The use of this container by more than one person may spread infection. Non-Medicinal Ingredients: Benzalkonium chloride, disodium edetate, sodium chloride, sodium phosphate, water. Check out the many reviews for this product, or review it by clicking here!